The quilt pictured belongs to my friend Jan Willis. The pattern is one most modern quilters would call Bear's Paw. But this baby is from Pennsylvania and dates from the 1870s. When the block was done in two colors and set on the diagonal, Pennsylvanian quiltmakers more often called it by the heart-warming name Hand of Friendship. But wait--there's a third name even more colorful: Duck's Foot in the Mud. This is the sweetest example of a 19th century quilt. It's what I'd call 'honest' in that it has no pretensions, the design is simple, there are sweet touches like the applique border, and it's beautifully made. Count those stitches--12-14 stitches to the inch! Since Jan's a crackerjack hand quilter herself, this quilt belongs to the right person. 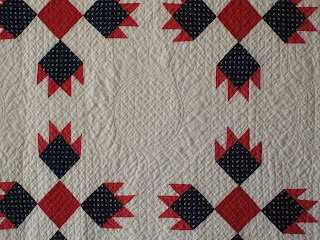 Red, green, white, and indigo-this quilt is so American!